Ahem. That wasn't weird at all. Anyhoo! 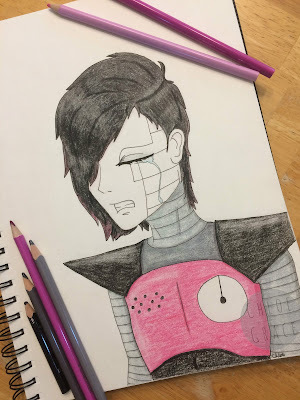 I drew Mettaton again. I drew him for my sis, Lostfariy, because she was feeling sick. And I wanted to draw her something that would cheer her up. :) I knew she really liked a scene in Undertale that had to do with Mettaton crying. (I don't think I can say why due to spoilers and snuff.) All I can say is... Mettaton made a choice and he regrets a sacrifice that he had to make when he made that decision. So that's why I named this art "A Sense of Loss," because when I looked up the meaning for regret one of the phrases in the description was that. Some people think Mettaton cries oil and others think it's regular tears and others still think it's oil and makeup. XDD I don't have a strong opinion about that. But I made Mettaton cry real tears in this artwork. I've been erasing lots more in my art to get lighter spots and I think it's been working out really well. XD As you can see, I did erasing in this artwork, too. What are you going to do in the summer?